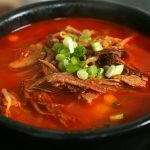 I’m re-introducing the delicious and nutritious yukgaejang to you today: spicy beef and vegetable soup. 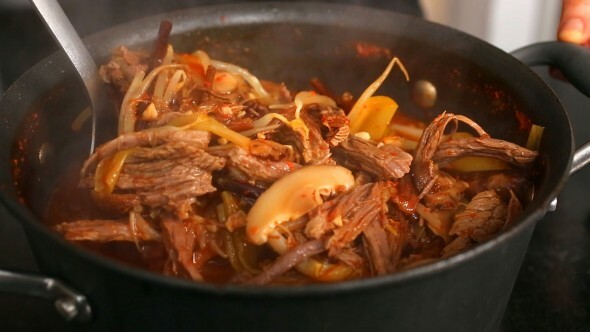 This soup is smoky, spicy, and rich, with healthy hunks of sliced beef and plenty of vegetables that are soft, but not mushy—they’re full of earthy mountain flavor from gosari (fernbrake). Served with rice, it’s a satisfying, warming meal. I made a video for this recipe years ago. It was on my first low-def camera, and eventually the music was removed in a copyright claim. 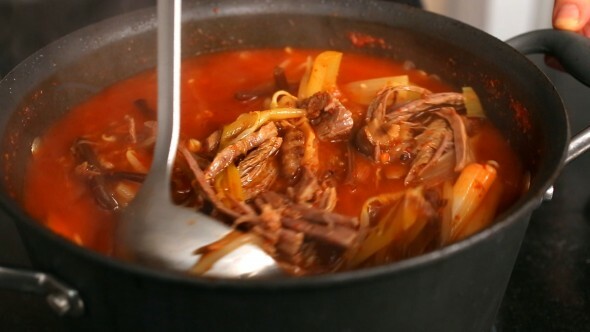 Even though the video was rough, the recipe was very good and many people used it to make delicious yukgaejang. I thought the time was right to remake the video in HD and rewrite the recipe. When Koreans make yukagejang, they always make it in large batches to make it worth the effort. 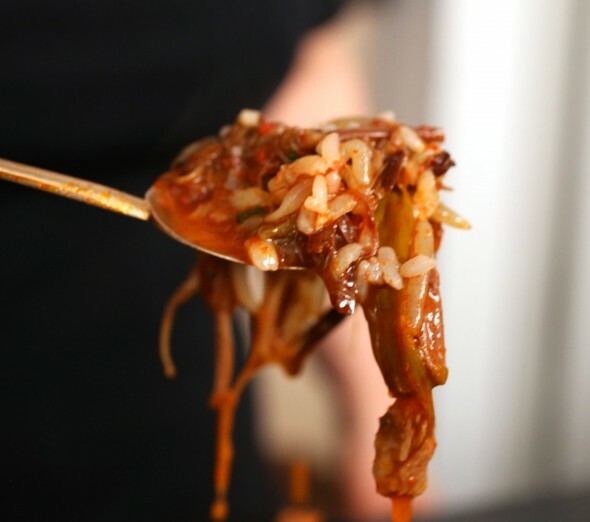 Extra yukagaejang is full of good stuff and never goes to waste: you can bring some to your friend’s house, or a close neighbor may get a knock at the door and find you there with some yukgaejang to share! 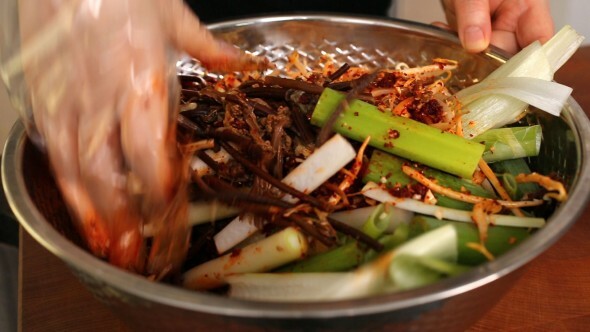 It’s also common for Korean moms to make a big pot of yukagaejang to keep their family sustained while goes away for an extended time. That way she can visit her own mom and not worry about her children and husband starving at home. It can keep in the fridge for 3 to 4 days, or up to 1 week if you reheat it every other day. One of my readers told me he divides it into portions and then freezes them, and then takes out a portion whenever he wants some for a meal. Good tip! Homemade yukgaejang is always better than yukgaejang at a restaurant, because you can take care to add a lot of the best ingredients, perfectly prepared. Some restaurants might not include gosari, either. It’s an essential ingredient! 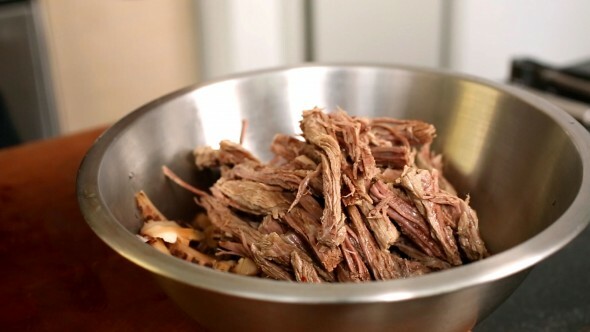 Enjoy my updated yukgaejang recipe and let me know how yours turns out! In a large pot, bring 3 quarts (12 cups) of water to a boil. Add the beef along with the dried shiitake mushrooms and the onion. Cook for 1 hour over medium high heat. Combine the sauce ingredients in a bowl and mix it well. Cover with plastic wrap and set aside. 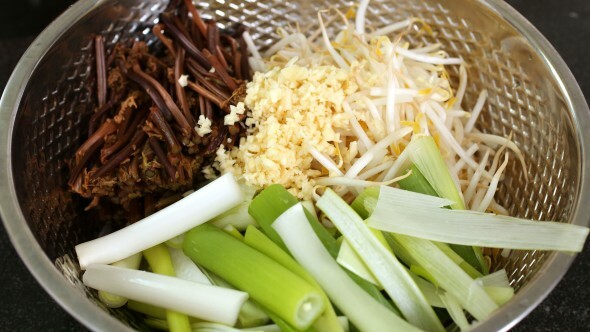 Put the mung bean sprouts, green onions, gosari, and garlic in a large bowl. 1 hour later, check the beef. Take a sample chunk and split it with your fingers or fork. If it splits nicely, it’s done. If it’s a little tough to split, let it cook for 10 more minutes. As stock boils off, you want to maintain about 10 cups’ worth, so add some water. When it’s done, remove the beef, onion, and mushrooms with a slotted strainer. 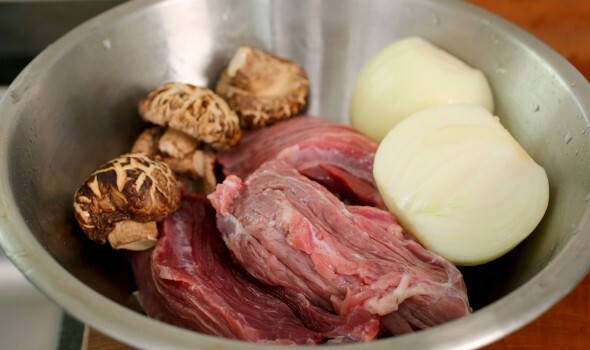 Let the beef and mushrooms cool down and discard the cooked onion. Mix the vegetables with the seasoning sauce by hand until well incorporated. Add to the boiling stock. Cover and cook 20 minutes over medium high heat until the vegetables are cooked through and tender, but not mushy. 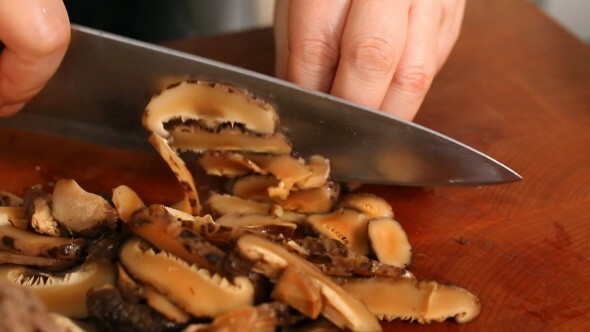 Slice the mushrooms and pull the beef apart into strips. Add to the boiling soup and cook another 10 minutes. Remove from the heat, ladle and serve. Prepare a small bowl of salt on the table, for anyone who wants to add some. Serve with rice and side dishes. Before eating, people can add a pinch of salt to their taste if they like. Posted on Tuesday, November 6th, 2007 at 11:25 pm. Last updated on April 24, 2016. Posted March 15th, 2009 at 9:22 pm | Log in to reply. Use the one on the right which is hot pepper flakes. Posted March 15th, 2009 at 9:05 pm | Log in to reply. here is the pics. I forgot to copy the link in the last comment. Posted March 15th, 2009 at 9:04 pm | Log in to reply. I am in Hawaii, and I went to Korean store in here, I only found 2 kind of hot pepper power. which showed you below. 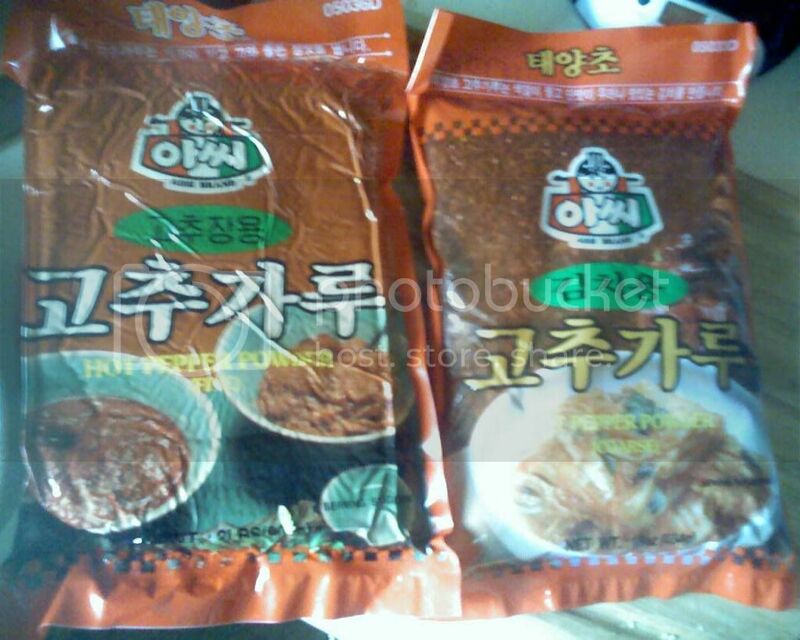 Which one should I use it to Yuk Gae Jang? Was I bought the Mild hot or very hot? Posted March 14th, 2009 at 2:10 pm | Log in to reply. haha, you added more hot pepper flakes and soy sauce? You did a good job! I always encourage ppl to adjust my recipes to their taste. Posted March 14th, 2009 at 1:01 pm | Log in to reply. One thing we noticed was that we think the yukgaejang we had in Korea was a LOT more spicy than your recipe so we just added more gochugaru and soy sauce. Also, we prepared TOO MUCH gosari than needed so we have a whole plastic bag of gosari in our fridge! The dried gosari really expands a lot! We’re going to make bibimbap tonight to use the rest of the gosari. Again, we both love your videos and we’ll be making a lot more Korean food because of it. Thank you! Posted March 14th, 2009 at 7:43 am | Log in to reply. 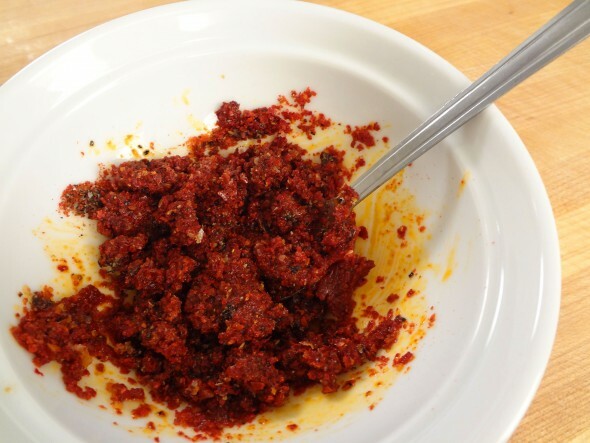 You can use either hot pepper flakes or hot pepper powder. I use hot pepper flakes. Posted March 13th, 2009 at 11:26 pm | Log in to reply. As your recipe, you said we should use hotpepper flakes, but in the video, you said power, which one is right? Since I used flakes to make it, but its too much hotpepper flakes at the end, and I might bougth the wrong one, because it was not spicy! haha!! BTW thanks for your video..it is very good!!! Posted March 3rd, 2009 at 12:05 pm | Log in to reply. wow, maangchi. you are doing a great job. i love love love your website. you are the bomb! Posted February 24th, 2009 at 12:13 am | Log in to reply. Posted February 22nd, 2009 at 9:46 pm | Log in to reply. Hi Maangchi, I used your recipe and made a pot just as big as the one in your video! YUM! Posted January 30th, 2009 at 12:58 am | Log in to reply. sure, bossam recipe will be included in the list of my upcoming video recipes. Thanks! Posted January 30th, 2009 at 12:53 am | Log in to reply. Hi Maangchi :D I looovveeee your recipes! I became inspired to cook korean dish and in fact, I’m gonna buy the ingredients at korean market tomorrow. :) I <3 yukgaejang! oh, and do you have any bosam recipe? Posted January 18th, 2009 at 11:06 pm | Log in to reply. ur amazing maangchi!ur so cute and ur voice to. Posted December 18th, 2008 at 6:02 pm | Log in to reply. I hope your “yukgaejang” turned out good! 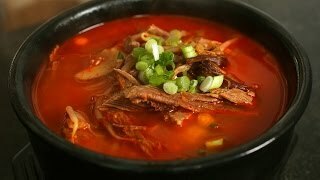 How did you know this soup is good for cold! You are very smart! Yeah, if kosari is not available, skip it then. Posted December 18th, 2008 at 9:34 am | Log in to reply. This recipe was originally posted on November 6, 2007 at 11:25 pm by Maangchi. It was last updated on April 24, 2016. The video was watched 999,021 times on YouTube & has 17,880 likes! This video is a remade version of an earlier recipe. The original video was posted on and has 0 views.